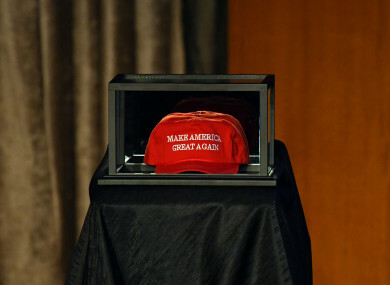 A Make America Great Again hat placed on the side of the stage prior to Donald Trump speaking to supporters at New York last year. A MISCONDUCT HEARING has opened into a Canadian judge’s wearing of a “Make America Great Again” campaign cap in court the day after Donald Trump was elected US president last November. Judges in Canada are forbidden from expressing partisan political views as a way of ensuring the appearance of their independence. Ontario Court Justice Bernd Zabel said wearing the red cap bearing Trump’s campaign slogan was meant as a dig at colleagues who had supported Trump’s rival for the US presidency, Hillary Clinton. But it drew 81 complaints from legal associations, law professors, lawyers and the public – the largest ever over a judge’s behaviour in Canadian history. Zabel apologised after the outcry, calling his wearing the Trump hat a “misguided attempt to mark a moment in history by humour in the courtroom following the surprising results in the United States election”. According to public broadcaster CBC, Zabel’s counsel Michael Fenrick told the hearing the judge regrets his actions and “does not associate himself whatsoever with the idea of misogyny, bigotry or racism”. “He will never wear that hat in court again,” he assured the panel. The judicial conduct review panel could dismiss the complaints, reprimand or suspend Zabel, or recommend to the attorney general his removal from the bench. Email “Canadian judge in misconduct hearing for wearing 'Make America Great Again' hat in court”. Feedback on “Canadian judge in misconduct hearing for wearing 'Make America Great Again' hat in court”.